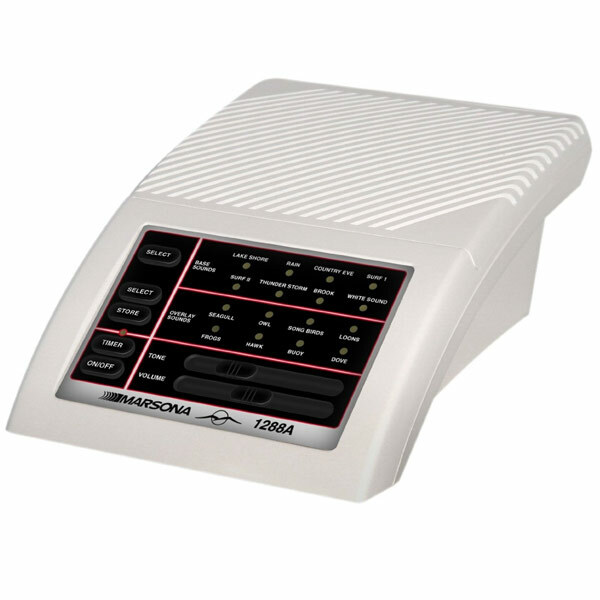 Technology, style and function come together in the premium edition of the Marsona 1288 Programmable Sound Conditioner. It features the ultimate in high quality sound, variety of sound selections and ease of operation in a soft, but elegant design. The Marsona 1288 provides perfectly controlled sound conditioning for masking unwanted noise for a good night's sleep, or to aid in concentration or relaxation. Features: Programmable overlay sounds. Optional 60 minute shut-off timer. Simple push button operation. Digitized and synthesized effects. Color LED selection indicators. Auxiliary jack, for headphones or other devices. Distinctive Styling. Integrated Circuitry. One Year Limited Warranty. Made in the U.S.A.